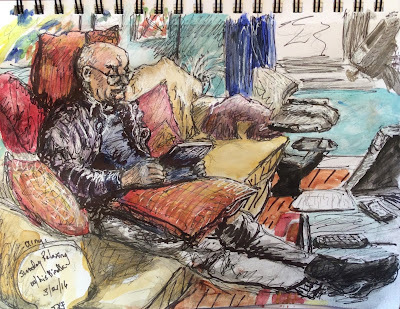 As part of my effort to keep growing as an artist, a while ago I joined a daily sketching group. I am not as faithful as some people are about doing and posting work each day. But, seeing other's work inspires me to do more and stretch in ways that I might not otherwise. For instance, lots of people often work al la prima, while I am more used to working from photo references. The sketch to the left was inspired by those brave souls. I call it, "Arny Relaxing With a Good E-Book. I did it yesterday from life. Arny is my husband, and he was such a good sport posing for me. Like any good model, he had to stop in the middle when his feet fell asleep. I painted it because he looked so relaxed (and cute) while nestled in all those pillows. His response was, "I look so much like my dad", and, basically, he is right. True ... he is taller, has somewhat more hair, and has a mellower personality, but otherwise, he's the spitting image of his dad. Unless someone specifically asks me, I won't put this piece up for sale. The other piece I'm featuring today is a piece I am making available on auction in my dailypaintworks.com gallery. 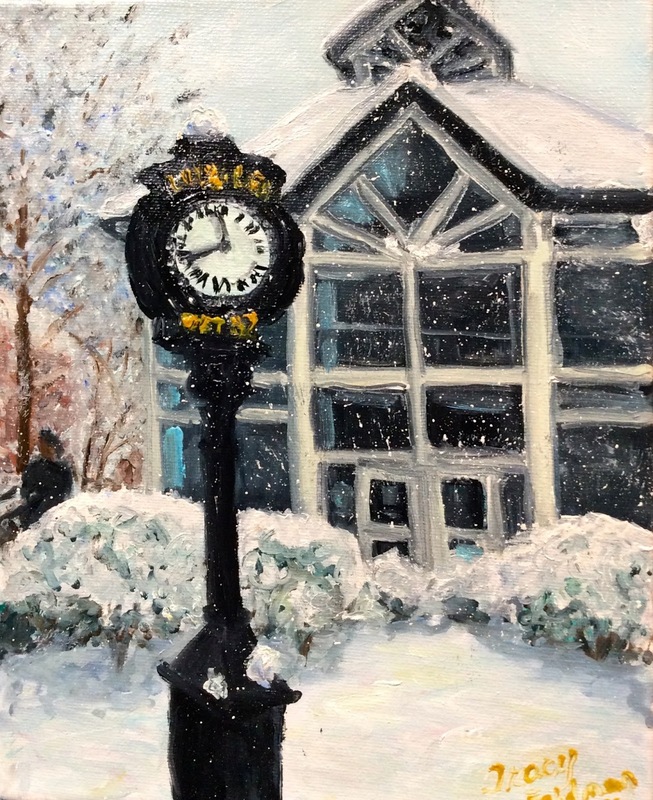 The painting is called, Snowy Day at F&M 1. It is of a clock on the campus of Franklin and Marshall College during the huge snow storm we had a A couple of weeks ago. Arny was on the campus for part of it because he is a mathematics professor there, and he used his iPhone to take a number of beautiful photos of the campus in the falling snow. I particularly loved this one, so I painted small (10 x 8") version of in oils. I am putting the painting up for auction in my Daily Paintworks Gallery. I call it "Snowy Day at F&M 1" because I might paint some other of the images he captured that day. Check it out there if you want.